So the people who own this album didn't care about editing the matrix of the record? This, much like Wishbone Ashes first album on MCA Records has quite a lackluster sound. Its very low end murky and quiet for the most part, making worn copies very hard to play. Not very dynamic or present either and just leaves me dumbfounded at why no one else mentions this. There are some nice harmonics and detail in the soundstage compared to the forst album though and it shows how tjis was recorded better. Too bad the mastering engineer was not. I have no idea if any other release better the slacking aspects or not but it would be great to hear someones input on it. Digital remastered copy on to a vinyl, you got the point. Avoid at all costs. I seem to have one from the UK with a gatefold cover? Anyone else seen/heard/have this? What is exactly the label variation of this release? I can see two versions were released in 1972 but which one is the 1st pressing? 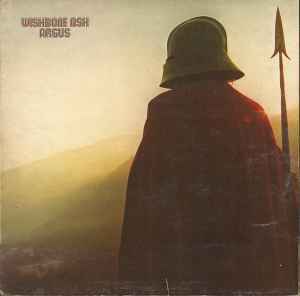 Ever discovered by Ritchie Blackmore (during a sound check in the opening act for Deep Purple), the English rock band Wishbone Ash since its inception in 1966 guarantee a recognizable mix of hard rock and prog-rock. Through the years the band has built up a solid fan base and especially by the lovers of symphonic rock is the group. On the new studio album Bona Fide is good to hear why. On the ten songs, which are produced by frontman Andy Powell, time seems to have stood still. Everything on the plate reminds of the 1970s: from the lumbering hard rock riffs to the double guitar licks. Enter symfofan for the inveterate but hardly interesting for lovers of modern rock. Hmmm... Can't find an exact match for my copy here. It is MCA-49 with (FORMERLY DL7-5347) printed underneath, and "All selections previously released on DECCA album old number DL7-5347 entitled ARGUS" underneath that. The sleeve is NOT gatefold, yet still gives a credit for inside photos: Barry Wentzell. Thoughts? Hexagon label appears to be on first copies .from may 73 plain black labels were used - exactly the same Cat#'s except side b has 7-LNMG.257. I think this is a reissue, due to the codebar or the serial number for CD format on the backcover. But every year printed is 1972.